For many elementary school students, completing homework assignments can be a difficult task due to a lack of organizational skills. A homework planner is the best solution to this very common problem. 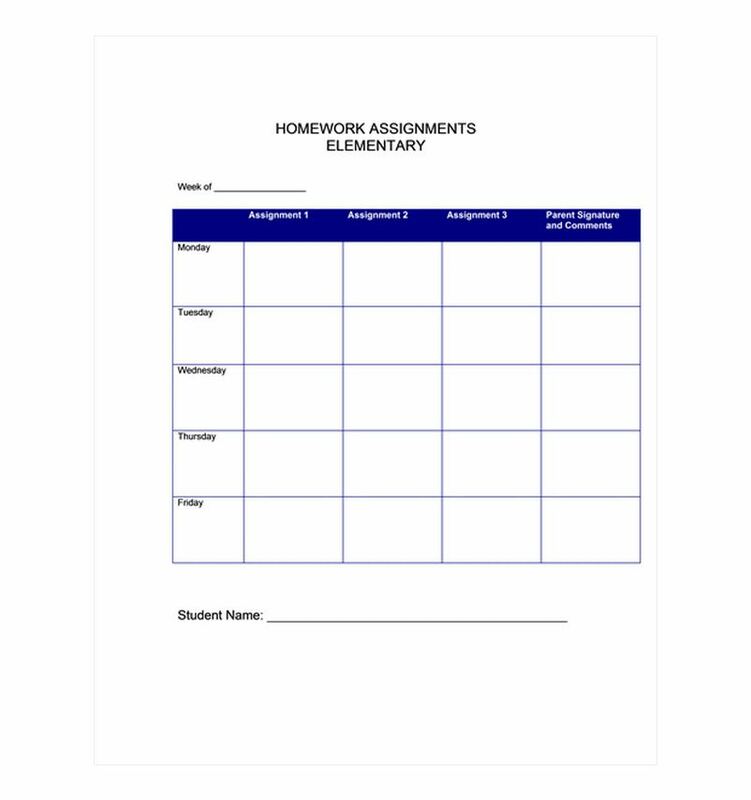 This elementary school homework planner makes it easy for parents, teachers, and students alike to keep track of assignments in an effective way with daily columns for each assignment followed by an area for parents to sign and make comments regarding each one. It leaves plenty of space for students to write in their own assignments to begin taking responsibility for them. The first step to using this homework planner is to download right from this website for free. Then simply open it up in Microsoft Word. It is quick to download and very easy to use. Next, customize the planner as desired. It is easy to write the names of different classes in at the top or make some columns wider than others. Whatever you think will be easiest for the child, this planner is fully customizable. Finally, print out the planner and distribute it to your class if you are a teacher or your children if you are a parent. Teach students how to effectively use the planner by following some of the tips below. Be sure to teach students to write down each homework assignment as it is assigned along with a due date to ensure that the assignment is completed on time. Teachers can initial next to the homework notes for confirmation. Have students write down their assignments in pencil in case they make any mistakes when using this planner. It is good for elementary school aged kids to write in pencil anyway since mistakes are common and pens can be messy. Encourage students to cross out the assignments when they are completed. Crossing something out provides them with a sense of accomplishment and it is also an easy way to track what has already been completed. This planner is ideal for teachers who want to help their students keep track of assignments, but if you are a parent you can use this with your child as well. It is a great way for the child to become accountable.